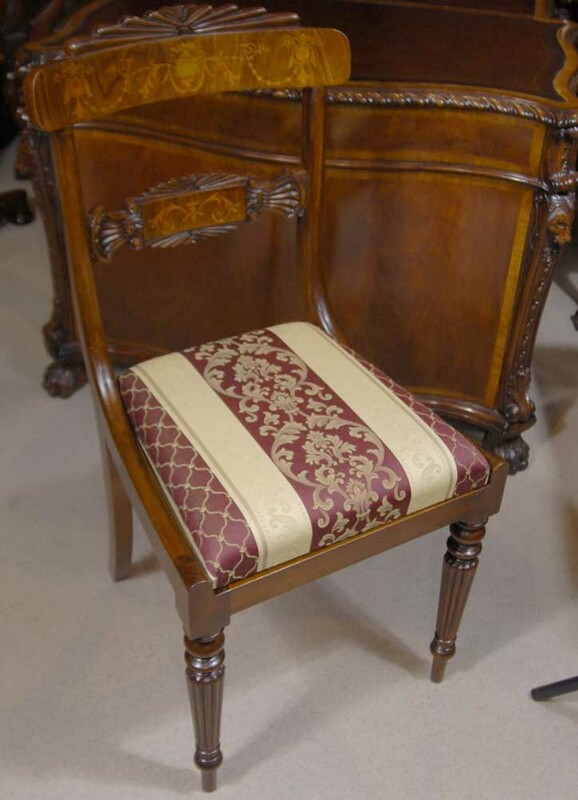 You are viewing an absolutely amazing set of twelve English Regency style dining chairs. The set consists of ten side chairs and two arm chairs. The chairs have some gorgeous marquetry inlay work which I hope the photos adequately illustrate, particularly on the backsplat with leaves, arabesques and other designs. If you imagine that each shape has to be hand cut from the softer fruitwoods and then embedded into the main structure of the walnut chair you can appreciate the time and skill involved. The backsplat is also particularly detailed hand carved. True to the Regency style the design is clean and minmal. The legs are fluted and these are solid and stable with no wobbles, ready for home use right away. The seats have a lovely patterned fabric, cushioned and comfortable to sit in. These have recently been reupholstered and hence are free from previous owners smells such as pets and smoke. These chairs will last for many generations hence making them a great investment. We also have shown these around a matching marquetry inlay dining table we have available, so please email if you are interested and we will work out a great price for you. This set is fit for a king and queen, the ultimate in luxury dining for your home.